Gangs of Madras is a very violent film as the story plays out like Kill Bill meets American Gangster, Rakta Charitra and Sarkar (Hindi). The film revolves around a lady who loses her husband in a police encounter shootout and now wants to take revenge on the gang that framed him. The ‘A’ certification that the film received is justified as the story is about revenge, drugs and gangsters. Priyanka Ruth in Gangs of Madras. The film begins with the African proverb – “The axe forgets but the tree remembers”. We are introduced into the world of Jaya, a fiesty young woman who holds her own. As a child she attacked a boy who had bullied her in school. Later in college during a demonstration, she slapped a police officer who had slapped her boy friend Ibrahim (Ashok), without any provocation. Jaya’s characterisation is clear: will hit back if provoked. When there is parental opposition, she walks out of her house and marries her lover Ibrahim after converting to Islam and becomes Raziya (Priyanka Ruth). Ibrahim works as a clerk in the office of Mohammad Rawthar (Velu Prabhakaran) and his sons Karim and Hussain. They are ruthless drug dealers who control the cocaine trade in Madras supported by a drug cartel run by Lala, a businessman and a state minister. One of Rawthar’s son has an eye on Raziya and frames her husband Ibrahim, who is killed by the police in an encounter killing. Like Uma Thurman in Kill Bill, Raziya, who is also newly married, wants to avenge the murder of her husband. 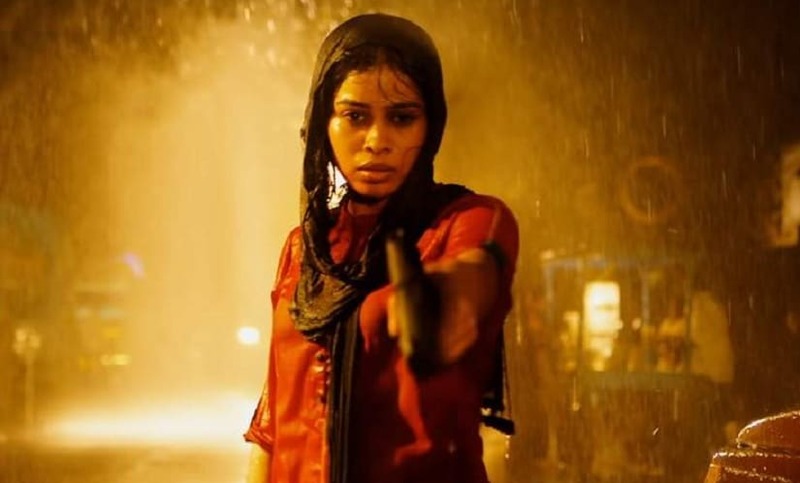 She contacts Rawthar’s bitter foe Boxy (Daniel Balaji) in Mumbai, who trains her to be a killing machine and sends her back to Chennai. This is when the revenge spree starts. Gangs of Madras is a stellar revenge story, and Priyanka Ruth (previously a TV actress) has done wonders with her part. Her expressive eyes and dialogue delivery make us root for Raziya. Watch out for a particular bit in the climax where she gets brutally kicked and smashed against a wall. The rest of the characters are not as well developed, though Velu Prabhakaran as Rawthar is menacing. Cameraman Karthik's red and green frames stunningly capture the bloodbath in the film. Shyamalangan's background score is in sync with the narrative. However, the writing is predictable and some of the characters are not convincing. Overall, Gangs of Madras keeps you hooked, even though there are several violent scenes in the film.